The AMD A6-7310 is quad-core SoC for entry-level notebooks. 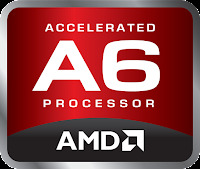 This accelerated processor (APU) has a base clock speed of 2.0 GHz but with Boost speed of 2.4 GHz. With 4 processing cores and a clock speed between 2.0 - 2.4 GHz, the technical specifications are somewhat similar to the previous AMD A6-6310, so the processor performance is only marginally better. This means the processor is suitable for everyday tasks like office and browsing; and even light multi-tasking should be no problem. The SoC (System on a Chip) is manufactured using 28 nm technology and includes a Radeon R4 GPU, a single-channel DDR3L-1600 memory controller and the southbridge with various I/O-ports. Compared to the predecessor AMD A6-6310, the AMD A6-7310 has a 200 MHz higher base clock speed. The integrated GPU in this SOC is Radeon R4 GPU which is similar to the Beema based Radeon R4 GPU with 128 shaders. Only older and simple games will run smoothly with this GPU. AMD A6-7310 PassMark Score. The higher the score the better the performance. Moreover, this SOC has 256 level 1 cache and 2048 kB level 2 cache. The TDP – Thermal Design Power of this SOC is about 15 watts. It supports 64 bit technology and hardware virtualizations like VT. This SOC was announced last May 7, 2015. 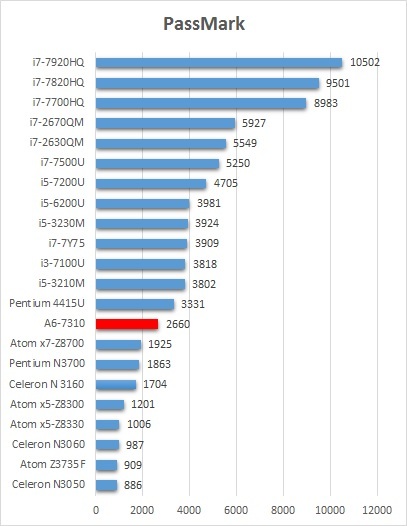 The AMD A6-7310 has a PassMArk CPU mark of 2660 which is more powerful compared to Celeron N3060 with a passmark score of 987; Atom Z3735F with a score of 909; and Pentium N3700 with a score of 1863 but less powerful than Core i3-7100U.